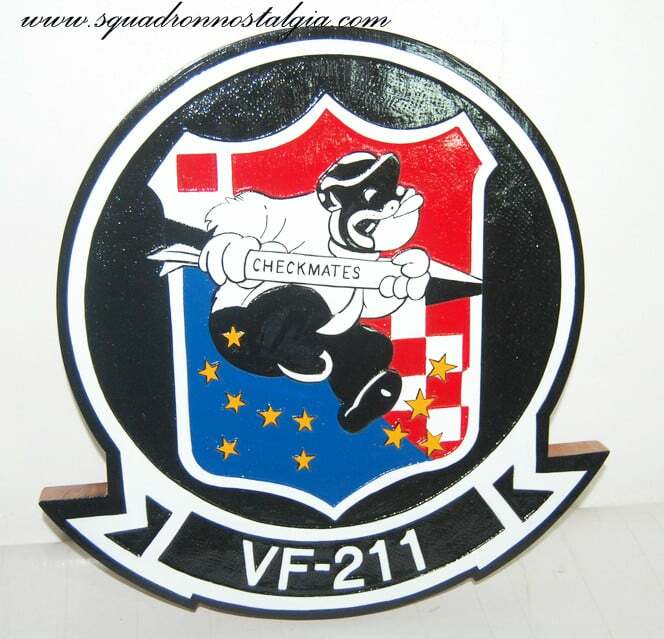 A beautifully carved 14 inch solid wood plaque of the VF-211 Checkmates! Collect all your squadrons with truly artistic craftsmanship of the Navy’s finest symbols. On the first day of May 1945, Bombing Squadron 74 (VB-74) Bomb-a-Toms was born, destined to become the present day Strike Fighter Squadron 211 (VFA-211) Checkmates. The Bomb-a-Toms began life at NAAF Otis Field, Camp Edwards, Massachusetts, with 36 Naval Aviators flying SBW-4E Helldivers. 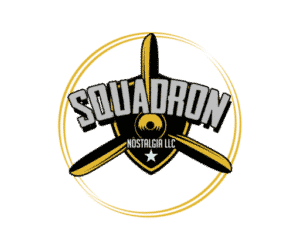 The squadron soon transferred to East Field, NAS Norfolk, Virginia, and made their arrested landings on 31 October 1945 aboard the newly commissioned USS Midway (CV 41). During 1946, VB-74 became Attack Squadron 1B (VA-1B) and transitioned to AD-1 Skyraiders. Less than two years later, the Navy again reorganized, and VA-1B became Attack Squadron 24 (VA-24), flying AD-2 Skyraiders. Skyraider aircraft were soon grounded because of engine problems, requiring a hasty transition to the F4U-4 Corsair a mere six weeks before departing on deployment aboard the USS Coral Sea (CV 43). After this deployment VA-24 moved to NAS Oceana, Virginia, and on 1 December 1949 was redesignated Fighter Squadron 24 (VF-24). Following a move to NAS Alameda, CA, VF-24 made two back-to-back deployments to Korea inflicting heavy damage on enemy emplacements, rail yards, bridges, warehouses, and airfields. Following the second deployment, VF-24 relocated to NALF Santa Rosa, CA, and transitioned to the F9F-2 Panther, the squadron’s first jet aircraft. In February 1952, VF-24 deployed aboard the USS Boxer (CV 21) and headed to Korea for their third combat tour. Throughout the 1950s, VF-24 flew a number of aircraft, including the FJ-3 Fury, the F3H-2M Demon, the F-11F Tiger, and finally the F-8 Crusader. 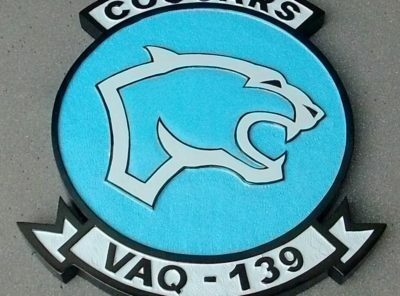 On 9 March 1959, VF-24 traded air wings, insignia, and designations with Fighter Squadron 211 (VF-211), the Checkmates. In 1961, the Checkmates moved to NAS Miramar, California, their home for the next 35 years. On seven deployments during the Vietnam War, VF-211 pilots earned the title of “The MiG Killers,” having downed eight enemy aircraft in air-to-air engagements. In December 1975, VF-211 transitioned to the revolutionary new F-14A Tomcat. The Checkmates completed numerous WESTPAC deployments during the 1970s and 1980s and in 1989, upgraded to the more advanced F-14B. 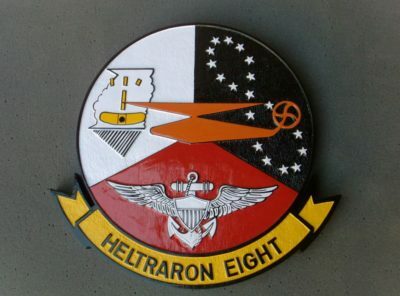 In 1991, the Checkmates deployed to the Arabian Gulf in support of Operation DESERT STORM., providing air superiority and aerial reconnaissance imagery for coalition forces. Transitioning back to the F-14A in 1992, the Fighting Checkmates deployed to the Arabian Gulf in 1993 and 1995-96. In August 1996, the Checkmates moved back to NAS Oceana, VA, in conjunction with the turnover of NAS Miramar to the U.S. Marine Corps, VF-211 remained attached to Carrier Air Wing Nine. In 1997, the squadron deployed aboard USS Nimitz (CVN 68), spending four months in the Arabian Gulf in support of Operation SOUTHERN WATCH. VF-211 flew daily sorties over Iraq enforcing the United Nations imposed no-fly zone, providing valuable photo reconnaissance imagery. In 2000, VF-211 joined USS John C. Stennis (CVN 74) for its Millennium Cruise. Over a four-month period in the Arabian Gulf, the Checkmates led the air wing conducting 16 precision strikes in support of Operation SOUTHERN WATCH. After the terrorist attacks of September 11, 2001, the Checkmates deployed with Carrier Air Wing Nine, in an accelerated schedule that had VF-211 aircraft flying combat missions over Afghanistan by December. 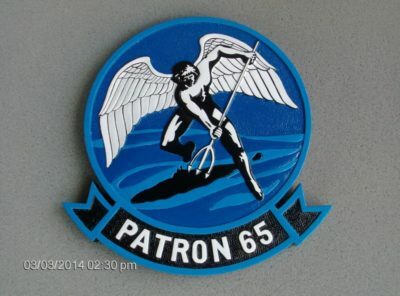 The Checkmates left their mark on Operation ENDURING FREEDOM during a three-week battle named Operation ANACONDA where they flew day and night sorties to defend coalition forces and eliminate Al-Qaeda resistance. The Checkmates returned after flying 1,250 combat missions and were then assigned to Carrier Air Wing One. VF-211’s performance in 2002 was recognized throughout the fleet. For their achievements, they earned the West Coast Battle “E” for battle efficiency from Commander Naval Air Force Pacific Fleet, the Grand Slam Award for excellence in Air-to-Air employment fromby Commander Naval Air Force Atlantic Fleet, and the Clifton Award for the most outstanding overall performance in battle efficiency and employment from Commander Naval Air Forces. Additionally, for their precision and innovation in strike warfare, they awarded the coveted VADM “Sweetpea” Allen Precision Strike Award. 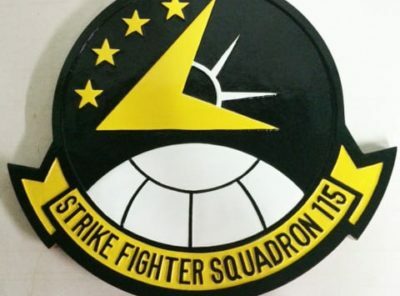 The last squadron to fly the venerable F-14A Tomcat, the Checkmates deployed aboard USS Enterprise (CVN 65) in October of 2003 in support of Operations IRAQI FREEDOM and ENDURING FREEDOM (OIF and OEF). The squadron flew over 450 combat hours during October, November, and December in support of coalition efforts. 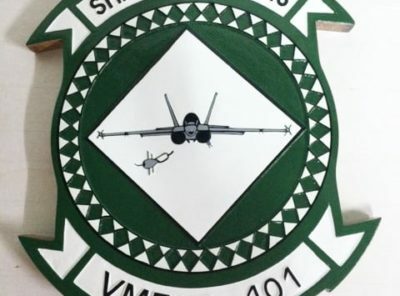 VF-211 was redesignated Strike Fighter Squadron 211 (VFA-211) after successfully completing the transition to the FA-18F Super Hornet in 2005 at NAS Lemoore, CA. Upon their return to NAS Oceana, VFA-211 became the first operational east coast Super Hornet squadron, completing back-to-back combat deployments in support of OIF and OEF. In early 2008, the squadron transitioned to the Block II Super Hornet, equipped with APG-79 radar, the world’s most advanced airborne intercept radar. 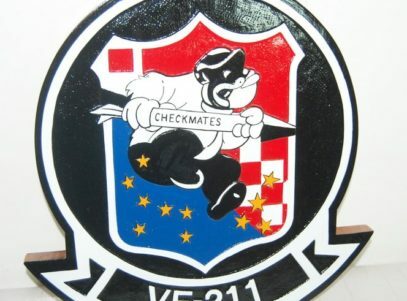 The Checkmates’ squadron logo depicts a cartoon character, known as “Brutus,” holding a rocket, in honor of the original logo of VB-74. The eleven stars are arranged in groups of seven and four, marking VB-74’s numerical designation. 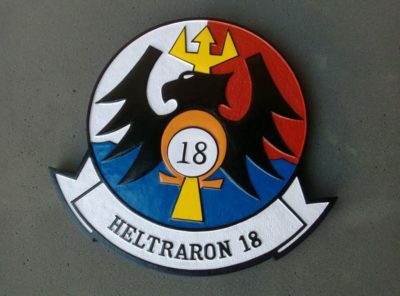 The shield recalls the squadron’s sixteen-year association with the F-8 Crusader. Recently, VFA-211 returned from two back-to-back deployments aboard Enterprise in support of United States interests abroad. Soon, they will begin work-ups to once again take the fight to the enemy in defense of the United States. The Checkmates want to thank the generations of Sailors and Naval Aviators who have worn their colors and for the sacrifices they have made in defense of freedom.